At this point, I hope someone has caught on to the fact that I post a lot about breakfast foods. There is a good reason behind this habit of mine. I, simply, adore breakfast! Hands down, it is by far my most favorite meal of the day. Not only do I need to have breakfast to get through the day, but many of my favorite foods are served: coffee, eggs, french toast, eggs benedict, specialty pancakes, muffins. The list could go on and on. I hope it would come as no surprise that my updates from Yum! Cafe and Bakery heavily focus on their breakfast menu. Sadly, they don’t have this menu posted online to look at so you’ll have to make due with my experiences. I had a day off of work so I decided to head over to Yum! to grab a good breakfast and catch up on the news from the StarTribune, the largest newspaper in Minnesota. 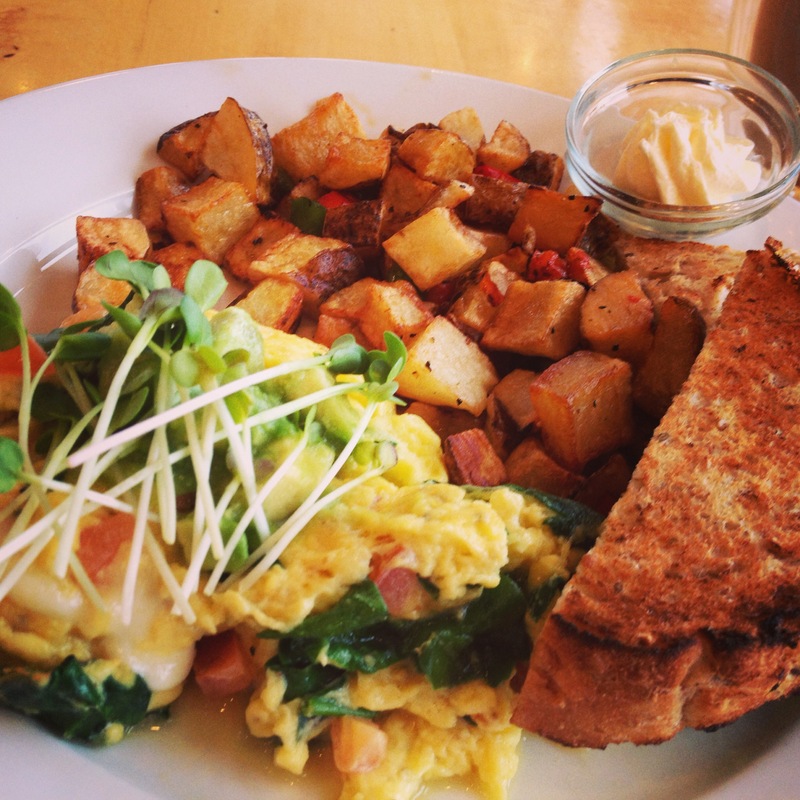 I went with the Spinach scrambled eggs because, 1. I love the taste of spinach and the amount of iron it contains and 2. I wanted something cheesy, and 3. it came with breakfast potatoes! This one was a winner! I would highly recommend this one for anyone in need of a filling and hearty breakfast. P.S. their breakfast potatoes are amazing. They are always soft, well seasoned, and never greasy. Scrambled eggs with spinach, diced ham, cheese and topped with bean sprouts. Served with breakfast potatoes and a side of toast. I love when my friends come to town and spend the night (Garrett, I’m talking about you) because we always end up stopping at Yum! for brunch. On our last excursion of Yum!, we decided that life’s too short to wait for dessert (What movie? Scroll to the bottom to find out!) so we had it first before our breakfast came. For me, one of the necessities of summer is having a slice of key lime pie. I don’t know what it is, but the flavor always reminds me of summertime; thus, I can’t properly say “it’s summer” without a bite out of this pie. Yum! did not disappoint. Just look at the heaping topping! Complete with a graham cracker crust and a lime filling that was silky smooth, it’s safe to say that this did not last long between the two of us. I’d like to meet someone who didn’t like this pie. 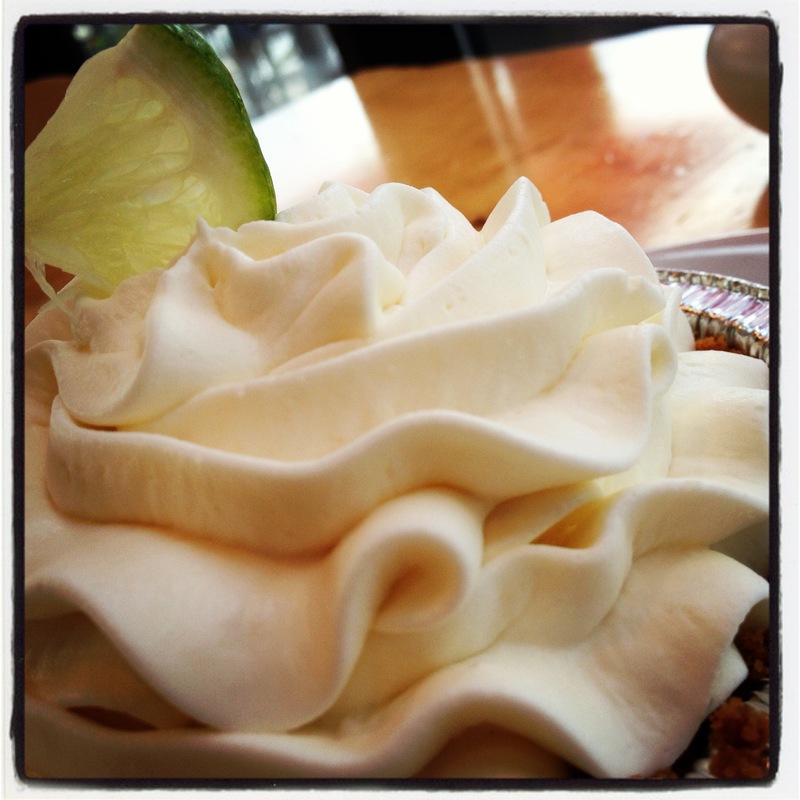 Yum!’s delightful key lime pie for two. During that same visit, I went with the Southwestern eggs scrambled as seen below. Overall, I thought it was okay. To be honest, I wasn’t the biggest fan of having the tortilla chips mixed in with my eggs. Since my buddies and I were having casual drinks last night and munching on tortilla chips, I didn’t really want more of them in my breakfast. In reality, the chips didn’t hurt the flavor of the meal, but the texture was off in my opinion. This morning, I most enjoyed the potatoes. Hats off to the cooks because their breakfast potatoes are always cooked perfectly and complete my breakfast cravings. These potatoes were cooked up with peppers and onions. Of course I love them because the peppers added a little “kick” to the overall flavor. 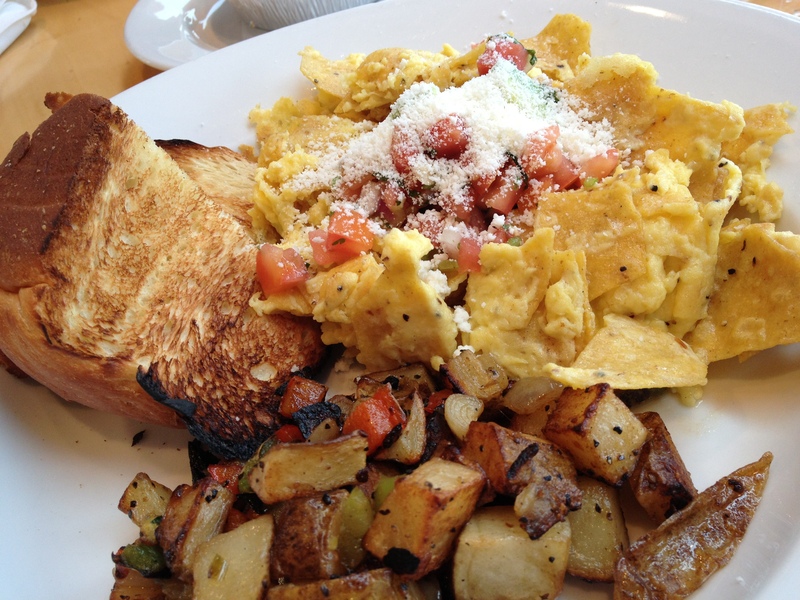 Yum!’s Southwest scramble is tossed with tortilla chips, onions, and topped with fresh salsa. Served with breakfast potatoes and a side of toast. Remember my reference to eating dessert first? The reference was from the movie “Remember Me“, starring Robert Pattinson and Emilie de Ravin. Kudos for any of you movie buffs who got that right! If you enjoyed this post and would like to read about my other visits to Yum!, check out my last blog post here.